The twenty-second Association peal of the year was rung at Hinstock. Eighteen ringers travelled to Hodnet for the December 8-bell practice. The ringing included plain courses of Plain Bob Triples, Grandsire Triples, Stedman Triples, and Middlesex Bob Triples, and touches of Grandsire Triples, Stedman Triples and Erin Triples. The Ringing Master is grateful to the more experienced ringers who came along to help. The towers represented included Albrighton, Baschurch , Edgmond, Lilleshall, Market Drayton, Meole Brace, Oswestry, Wellington, Whitchurch, and Wrockwardine. Thirteen ringers, and briefly two ‘grabbers’ from Hampshire, participated in this practice held at Meole Brace. The ringing included Cambridge, Yorkshire, Lincolnshire, London, Pudsey, 4-spliced and 8-spliced. The twenty-first Association peal of the year was rung at Lapley, Staffs, to celebrate a significant birthday. A cursory glance at ringing in the Association's area reveals that more ringers are needed at most towers. Many of our current ringers probably feel apprehensive at the thought of teaching beginners, and this of course makes it difficult to recruit learners with confidence. This scenario is not unique to our area and a few years ago a movement began to try to address these issues. The result is the Association of Ringing Teachers and their Learning the Ropes scheme, the idea of which is to provide a structured scheme to learn bell-handling and the early stages of change-ringing, and to train sufficient teachers to deliver the scheme. If successful, it is hoped to make learning more effective and more fun, thereby increasing the chances of recruiting and retaining additional ringers. It is against this background that an ART course was run at Edgmond, tutored by Paul Lewis. 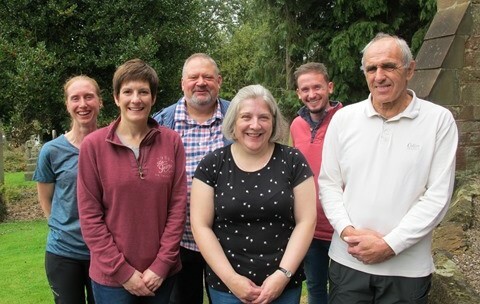 Those attending as potential teachers were Vicki Sivess and David Read (Meole Brace), Ian Darby (Pattingham), Sue and Derek Dancey (Bicton), Jacqui Barden and Biff Patterson (Shrewsbury) and Liz Menhinick (Unattached). Matt Lawrence, Gill Glover and Dawn Offen were present as potential mentors, while Nick Green and Alan Glover lurked as carers, and confusers. The day comprised a sequence of (mercifully) short PowerPoint presentations, practical sessions in the tower and the sharing of best practice and assorted horror stories. Refreshments were provided by Sue, Biff and Gill, and lunch was taken at The Lion. The course provided much food for thought for the potential teachers and should be the start of a process in which they are assigned a mentor and teach a recruit from scratch to the point where they can handle a bell safely and efficiently and are able to make a contribution to a tower in the area. ART provides much support in the form of publications and online material to make this as efficient and painless as possible for both teacher and learner. Watch this space for further developments, and if any other members are interested in getting involved in the scheme, please contact Paul [email] or Matt [email] for more information. Paul is intrigued as Vicky tries to sort out Jacqui's handling problems. Shawbury Village Hall was again the venue for this festival of food and dancing, organised again by Cordelia Warr. The music was provided by Monkey Box, and Baz Parkes returned as the caller. Geoff Harding organised the bar, with help from Jad Bienek. This year’s cooks were Cordelia, Jan Snowball and Claire Unsworth. They provided diners with lamb stew, beef stew and chicken stew, butternut squash and goats’ cheese casserole, and baked potatoes, with crusty bread. The main course was followed by delicious desserts, including trifles, lemon meringue pie, fruit compote and gluten-free brownies. The raffle, run by Peter Woollam, raised £125. The prizes of confectionery, alcohol, biscuits, marmalade and photo album were won by Vicki Sivess, Paul Smart, Peter Stafferton, Cordelia Warr, Peter Hampton, John Jackson, Claire Unsworth, John Neal, Karen Compton, Gloria Cawood, Gareth Jones, and Madeline Harris. Sixty five tickets were sold for this event, and thanks go to all who promoted the event so widely and all those who helped make this a very enjoyable evening. There was another good turnout of ringers at Atcham for the November 6-bell practice. Twenty one ringers, under the direction of Tony Freemont, had a go at call changes, Plain Hunt, Plain Bob Doubles, Stedman Doubles, Grandsire Doubles and Cambridge Surprise Minor. The towers represented at the practice included Atcham, Baschurch, Edgmond, High Ercall, Market Drayton, Meole Brace, Oswestry, and Shrewsbury. The nineteenth and twentieth Association peals of the year were rung at Chirbury and Pontesbury. The peal at Pontesbury was Paul Lewis's 50th peal for the Association. Thirteen ringers, and a very young future ringer, took part in this practice held at Edgmond. The ringing, directed by the Ringing Master, included Belfast, Bristol, London, Rutland, 4-spliced, 6-spliced, and 8-spliced. Thanks to Mark Adams for preparing the bells and setting up the simulator. These took place at Upton Magna. Seventeen ringers attended and the ringing included call changes, Plain Bob Doubles, Plain Bob Minor, Grandsire Doubles, St Clement’s College Bob Minor, College Bob Minor, Stedman Doubles, London Surprise Minor. Peter Woollam displayed the three banners which the Association has purchased for use by bands to advertise ringing. Contact Peter if you would like to borrow the banners for an event at your church. They can only be used indoors. Madeline Harris reminded those assembled about the Ceilidh to be held at Shawbury on Saturday 18 November, from 7:30pm to 11pm. Tickets cost £10 (£7.50 for 18s and under) and are available from Jacqui Barden, Peter Woollam, Biff Paterson and Chris Fraser. Madeline also reminded those present about the annual Carol Service, to be held this year at Ellesmere, on Saturday 9 December with ringing starting at 6pm. There was a short discussion about insurance, following on from the discussion at the last Quarterly Meeting. Susan Capey, Association Treasurer, was in the process of obtaining a quote from Ecclesiastical Insurance to cover members for Public Liability. There will be more information about this issue at the next Quarterly Meeting/AGM. There was a short discussion about Safeguarding following on from the recent article by Chris Mew in The Ringing World. Edric Broom reminded the meeting that the practices he holds at Edgmond on the third Wednesday morning of the month would resume on 18 October. Madeline mentioned the next 8-bell practice will be held at Hodnet on Saturday 2 December. The next 6-bell practice was still to be confirmed. The next Association Training morning will be held at Edgmond on Saturday 25 November. Peter Woollam raised £24 for the BRF from the sale of raffle tickets. Prizes of wine, jam and sweets were won by Jan Snowball, Gail Lawrence, and Biff Patterson. Peter thanked those who had donated prizes. The draw for the 100+ Club took place. The winners of the third draw of the year are: Roy Bloor (£50), Tony Bryant (£25), Karen Hampton (£15), Eric Pridding (£15), Maureen Broom (£12) and Judith Gibbins (£10). Thanks to Mike Lloyd for organising the use of the bells at very short notice. 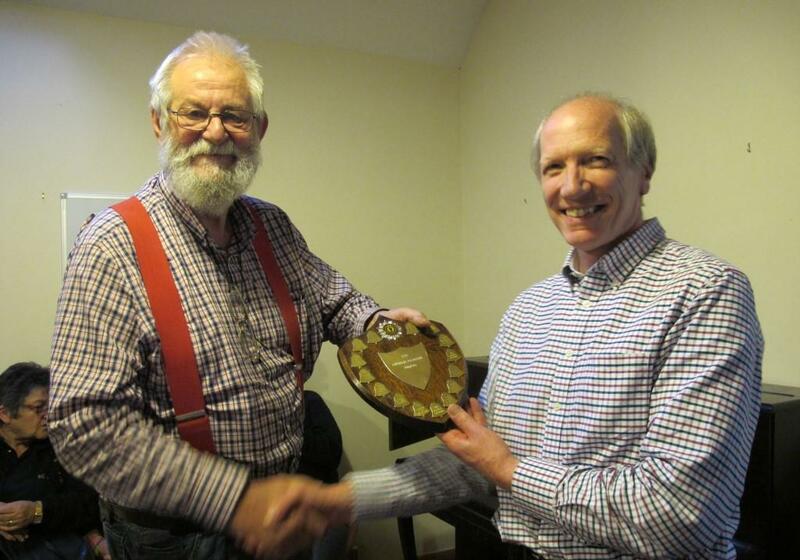 The eighteenth Association peal of the year was rung at Clive. The seventeenth Association peal of the year was rung at Edgmond to mark the retirement of the Rev. Preb. Edward Ward. The third annual striking competition between the three associations within the Lichfield Diocese was held at Albrighton on Saturday 23rd September 2017. The three associations each entered a 6-bell band and an 8-bell band. The 6-bell bands had to ring 240 changes of Doubles or Minor, and the set piece for the 8-bell bands was 168 changes of Stedman Triples. The faults for each association's bands were added together and the winning association was the one with the fewest combined faults. and the Lichfield & Walsall bands were duly declared the winners. Tim presented representatives of the two bands with the trophy. 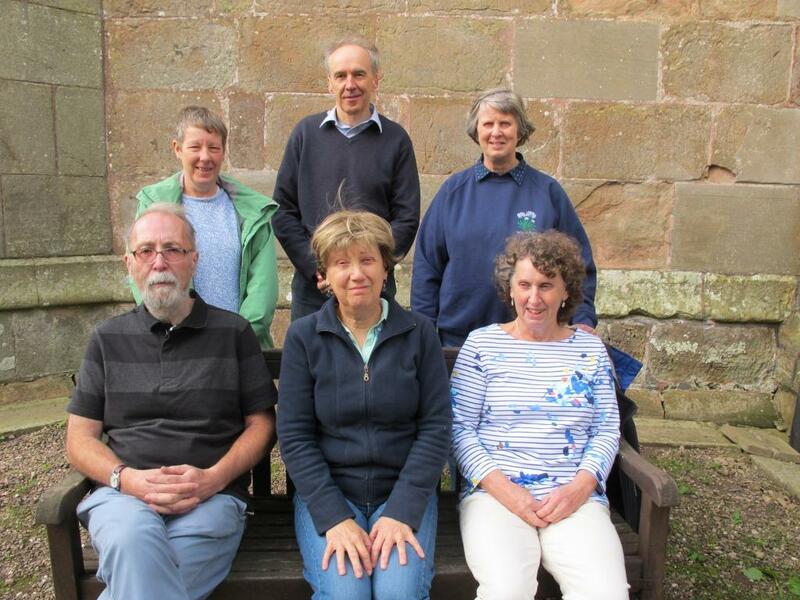 The third Association training morning of the year took place at the Edgmond Ringing Centre. Lois Crooks, (High Ercall), Vicki Sivess (Meole Brace), Emma Bentley, Lisa Basden (Atcham), and Geoff Harding (Baschurch) were the students. Madeline Harris was helped during the morning by Edric Broom, Jacqui Barden, Jad Bienek, Rob Davis, Chris Fraser, Alan Glover, Gill Glover, Nick Green, Brian Kear, Matt Lawrence, and Biff Patterson. The ringing included call changes, plain hunt on 5, Plain Bob Doubles, Grandsire Doubles, Stedman Doubles, Plain Bob Triples, and Grandsire Triples. Refreshments were available, as is usual on these occasions. Thanks to Edric for readying the bells and the simulator. We were lucky with the weather when the Striking Competition this year was held at Ightfield; a very wet morning and early afternoon was followed by a dry and sunny late afternoon. Ten bands representing 8 towers participated and the newly-formed youth band had its first experience of a Striking Competition. The draw for the order of ringing was held in the Amica Centre and tea was served there throughout the afternoon. Bands are pictured below in the order in which they rang. Six bands rang call changes and four bands rang a method – Grandsire Doubles in each case. Phil Gay, from Keele, was the judge. Before giving brief remarks on each band's ringing, Phil explained how he marked the test pieces, and said that he also listened to the practising. In every case there was some improvement during the ringing. Some of Phil’s comments were: 'fairly inexperienced band'; 'settled well'; 'random faults throughout'; 'good rounds'; 'very good test piece'; 'long, fault-free pieces'; 'ponderous'. 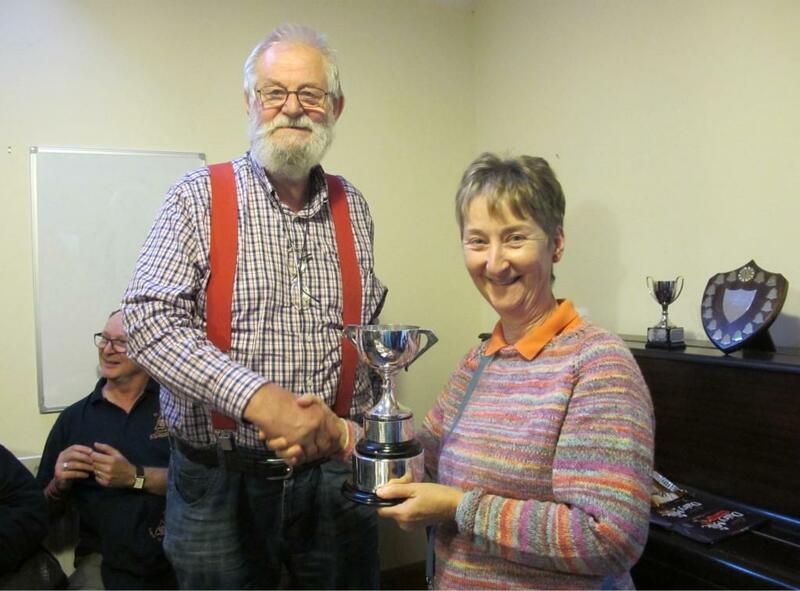 The Ernest Willcox Cup for the fewest faults was collected by Biff Patterson for the Shrewsbury 'B' team. The Call Change Trophy was collected by Andrew Gordon for the Wellington team. The Charles Allmand Memorial Shield, for the highest placed band which had not won a trophy in the preceding two competitions, was presented to David Beckwith for the Market Drayton team. A vote of thanks was offered to the Ightfield/Calverhall ringers and helpers for the use of their bells and for providing a sumptuous tea. Phil was presented with a gift of wine and chocolates. Geoff Harding ran the raffle, raising £63 for the Bell Restoration Fund. Those taking home the prizes of wine, chocolates, and fresh fruits were: Andrew Gordon, Mike Carding, Geoff Harding, Vicki Sivess, Edric Broom, and Gail Lawrence. Thanks go to all those who generously provided prizes and all those who bought tickets. Congratulations to Peter Neil for calling his first peal. 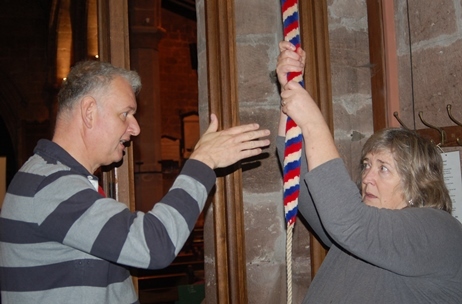 The sixteenth Association peal of the year was rung at Oswestry to mark the 300th anniversary of the casting of the bells there. A large crowd of seventeen ringers, including a visitor from the Hereford Guild, participated in this practice held at Wem. The ringing, directed by the Ringing Master, included Cambridge, Lincolnshire, London, Superlative, spliced Cambridge and Yorkshire, and 8-spliced. Thanks to Gareth Jones for hosting the practice. The fifteenth Association peal of the year was rung on 19 August, at Sandon in Staffordshire. This was held jointly with the Church Stretton District of the Hereford Guild and was held at Worthen. Twenty-three ringers attended, including eighteen Shropshire Association members. 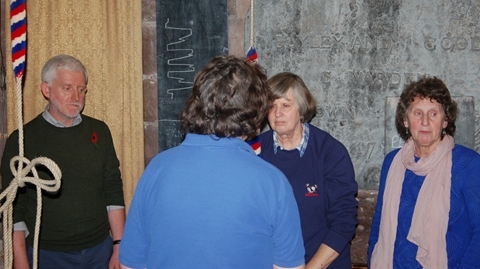 The ringing was directed by Andy Wilson of the Church Stretton District. A wide variety of methods was rung, including call changes, plain hunt on 5, Grandsire Doubles, Stedman Doubles, Plain Bob Minor, Plain & Little Bob Minor, Ipswich Surprise Minor, Spliced Surprise Minor, and College Bob Minor. 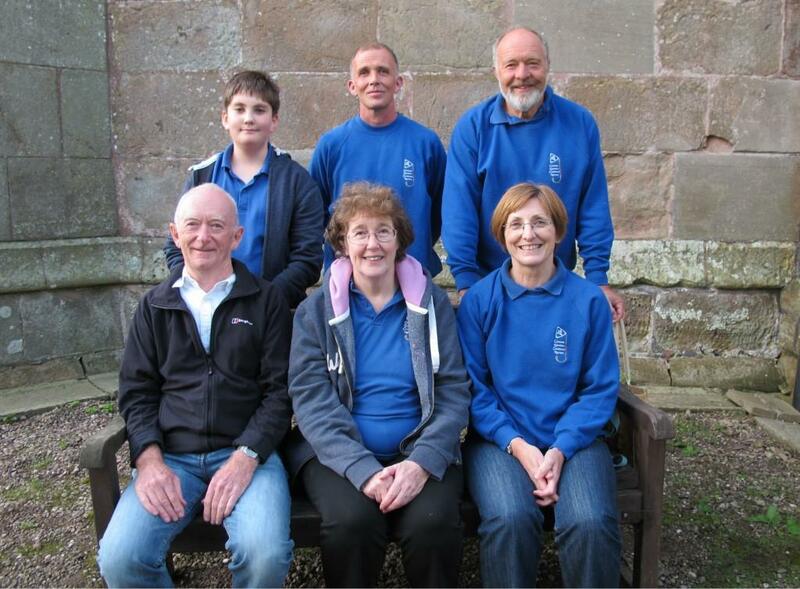 Thanks go to the ringers of the Church Stretton District for hosting the practice. 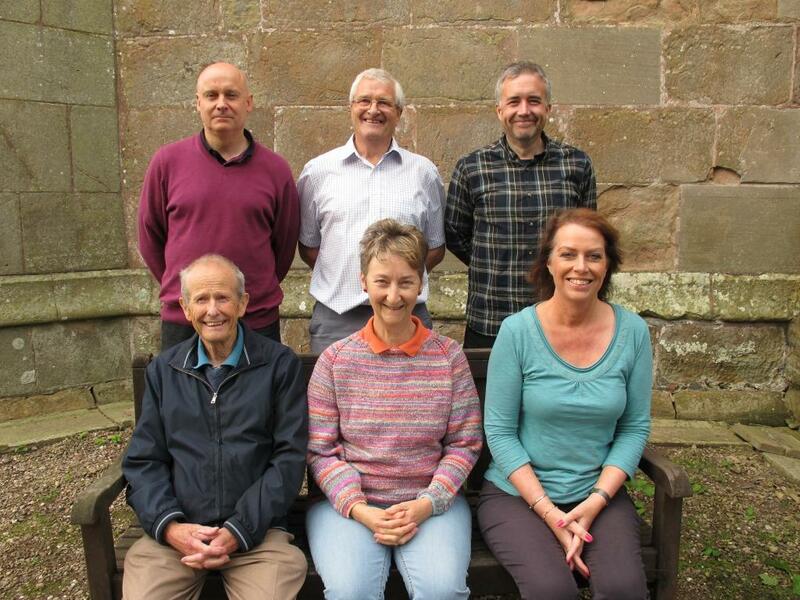 A record number of ringers attended the August 8-bell practice at St Luke's church, Hodnet. The ringing included plain courses of plain hunt on 7 and on 8, Plain Bob Triples, Grandsire Triples, Stedman Triples, and Plain Bob Major. The Ringing Master is grateful to the more experienced ringers who came along to help. The towers represented included Baschurch, Clive, Codsall, Edgmond, Lilleshall, Market Drayton, Shrewsbury, Wellington, Wem, Whitchurch, and Wrockwardine. Fifteen ringers, including a visitor from Haywards Heath, plus a very young baby, travelled to Edgmond on a wet Friday for this practice. The ringing included Bristol, Glasgow, Lessness, Lincolnshire, Rutland, and 4-spliced. Thanks to Rev. Preb. Edward Ward for allowing the use of the bells. The thirteenth and fourteenth Association peals of the year were rung on 22 July, at Ryton and High Ercall. The peals marked four significant birthdays totalling 190 years. 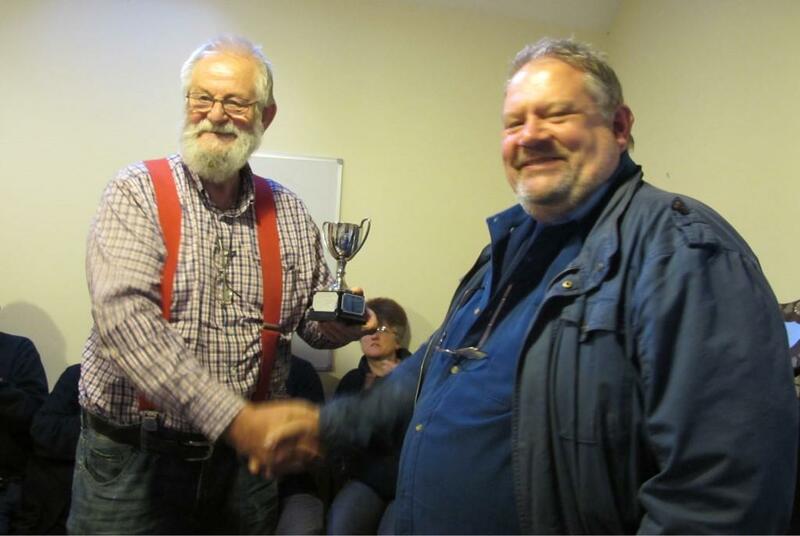 The peal at Ryton resulted in Andrew Gordon equalling Ann Williams as the two most prolific current member ringers of peals for the Association. The peal at High Ercall was the work of an up and coming composer. These took place at Montford on a lovely July evening. Twenty two ringers attended and the ringing included call changes, plain hunt on 5 and 6, Plain Bob Doubles, Plain Bob Minor, Grandsire Doubles. The meeting was held in the church. Eric Millington (Albrighton) was elected as a member of the Association. In the absence of Cordelia War, Madeline Harris spoke about the Ceilidh to be held at Shawbury on Saturday 18 November, from 7:30pm to 11pm. Tickets will cost £10 (£7.50 for 12s and under). Madeline also gave the Training Officer's report in Tony Freemont’s absence. Tony is planning to hold a Grandsire and Stedman (Doubles and Triples) training at Oswestry on Saturday 2 September. The next 8-bell practice will be at Hodnet on Saturday 5 August from 10am to 12 noon. There are still places available for the Training Morning to be held at Edgmond on Saturday 16 September, from 9:30am to 12:30pm; contact Tony [email] if you would like to attend. Madeline reminded those present about the Association’s Striking Competition, to be held on Saturday 9 Septemebr at Ightfield, starting at 4pm. Please let Jad Bienek [email] know by Sunday 3 September if your tower will be entering a band. Peter Woollam reminded members that the Central Council produces guidance notes on many subjects including Health & Safety, Risk Assessments, and Safeguarding. The Central Council has also produced a publication called ‘Bells In Your Care’, available online only, for incumbents and churchwardens. The publication can be found at www.cccbr.org.uk/wp-content/uploads/2016/03/bells-in-your-care.pdf. Andrew Gordon spoke about Jim Thomsett, a ringer at Albrighton, who had died on 20th June at the age of 82. A quarter peal had been rung on the day of his funeral. Ann Williams raised the subject of ringers’ insurance There was discussion about the need for insurance when visiting other towers and the costs of this insurance. It was suggested that the item should be added to the agenda for the next committee meeting. It was noted that, several years ago, the Association voted not to purchase insurance. Peter mentioned that several churches had been approached by telecommunications companies about installing masts on their towers. Useful information is available from Peter. Madeline reminded the meeting that nominations for Honorary Life Membership should be sent to Jad [email] no later than 31st August so that the committee can review the nominations at its meeting on 3 September. Peter Woollam raised £33 for the BRF from the sale of raffle tickets. Prizes of freshly-picked gooseberries and various forms of alcohol were won by Clive Morris, Sue Dancey, Peter Woollam, Brian Kear. Peter thanked those who had donated prizes. Brian Kear carried out the draw for the 100+ Club. The winners of the second draw of the year are: Gill Glover (£50), Simon Rice (£25), Claire Unsworth (£15), Steve Evans (£15), Judith Byne (£12) and John Neal (£10). Thanks go to Tricia Jones for opening up the tower and church, and for providing drinks and delicious cakes. Thanks also to Paul and Edwina Smart for their help in checking the ropes and cleaning the ringing room. The twelfth Association peal of the year was rung at Cheswardine to celebrate the 45th wedding anniversary of Lynn and Peter Hall. There was a good turnout of ringers at Atcham for the July 6-bell practice. Fifteen ringers, under the direction of Tony Freemont, had a go at call changes, Plain Hunt, Plain Bob Doubles, Stedman Doubles, Norwich Surprise Minor, and St Clement’s College Bob Minor. Several ringers benefitted from individual tuition on fine-tuning their bell-handling. The towers represented at the practice included Atcham, Edgmond, High Ercall, Lilleshall, Market Drayton, Meole Brace, Oswestry, Shrewsbury, and Wem. The tenth and eleventh Association peals of the year were rung on 1 July, at Bishop's Castle and Churchstoke. They resulted in Ann Williams becoming the most prolific current member ringer of peals for the Association. Fifteen ringers travelled to Meole Brace for this practice. The ringing included Cambridge, Glasgow, London, Rutland, Yorkshire, spliced Cambridge and Yorkshire, and 8-spliced. There was also a touch of Stedman Triples especially for Andy Digby of Meole Brace, who rang the tenor. 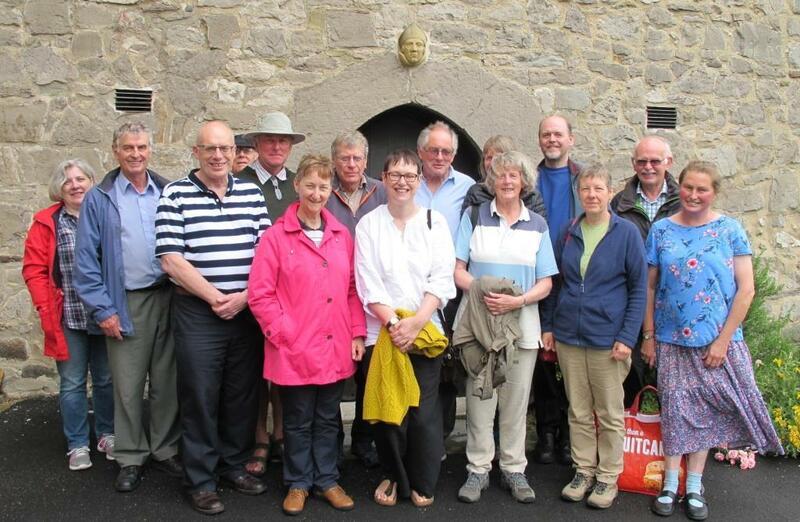 The ninth Association peal of the year was rung at Chetwynd to celebrate the 150th anniversary of the church there. The Association's Summer outing was held on Saturday 10th June. Cordelia Warr, the Association’s Social Secretary, planned a day’s ringing at towers in North Wales. The first tower of the day was at Harwarden (12cwt 6). The church of St Deiniol is next door to Gladstone’s library and, after the ringing, many of the ringers enjoyed coffee in the café there. The next stop was St Matthew’s at Buckley (14cwt 8). The tower before lunch was St Eurgain and St Peter (11cwt 8) at Northop. After a search for the key the band ascended to the ringing room which features a novel sound control arrangement that allowed more than one member of the group to alter the loudness of the ringing in the ringing room. Most of the group had lunch at Pen y Bont Farm pub at Mold, where the meals were served quickly. The first tower after lunch was the 14cwt 6 at Bodelwyddan – aka the Marble Church. Ringing here suffered from the usual post-lunch torpor. The final tower of the day was Abergele (8cwt 6). This has an L-shaped ringing room with the short arm of the L used as a sitting-out area. Call changes were rung at all the towers, in addition to Grandsire and/or Stedman (Doubles or Triples depending on the tower). Other methods rung included Plain Bob Minor, St Clement’s College Bob Minor, Cambridge Surprise Minor, Norwich Surprise Minor, Pudsey Surprise Major (half a course), Little Bob Major, Plain Bob Triples, and an attempt at 4-Spliced Surprise Major. Thanks go to Cordelia for making all the arrangements, to all those who came along and made it such a pleasant event, and to all those who ensured that we didn’t have a lock-out. The next social event will be the Ceilidh to be held on Saturday 18th November at Shawbury Village Hall. While the Association outing was taking place in North Wales, the eighth Association peal of the year was being rung at Stanton upon Hine Heath. 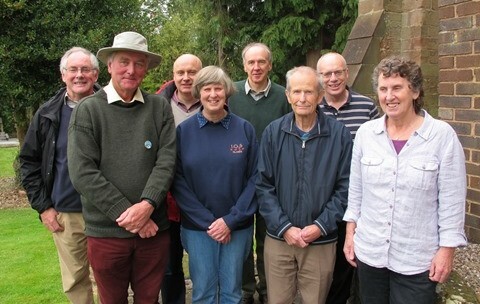 Visitors to the Plant Fair at Hodnet Hall were serenaded by the efforts of the fifteen ringers who turned up for the June 8-bell practice at St Luke's church, Hodnet. The ringing included plain courses of Plain Bob Doubles with three covers, Plain Bob Triples, and Grandsire Triples, and touches of Grandsire Triples and Stedman Triples. The Ringing Master is grateful to the more experienced ringers who came along to help. The towers represented included Baschurch , Edgmond, Hodnet, Market Drayton, Meole Brace, Oswestry, Shrewsbury, Whitchurch, Wem, and Wrockwardine. This was held in June at High Ercall and nine ringers participated. The ringing included Pudsey, London, Superlative, spliced Pudsey and London, and 8-spliced. Thanks to Chris Yates for allowing the use of the bells. The report of the Atcham ringers' actvities in 2016 was inadvertently omitted from the Report/Handbook which has been sent to all towers recently. It has been quite a successful year. We have had two recruitment days one on Magna Carta day and one on Heritage day which attracted four new members wishing to learn how to ring. We are grateful to John Upton for his enthusiasm in this recruitment and his commitment to providing one to one instruction. We have rung for 6 weddings with an additional one over Christmas and had 7 bands of visiting ringers. We have dedicated one practice evening and one Sunday service ring to two service men from Atcham who were killed in action or died from their wounds in WW1. Lance Corporal Hughes who died in action on 18 August 1916 and Private John Benbow died of his wounds 17th October 1916. A minute's silence was held on each occasion. Bill Price our steeple keeper maintains our ring of six bells with Elaine, Llynne, Marion and Emma ensuring that social events are arranged and suitable refreshments available when necessary. We participated in the striking competition and will put our experiences from that day into next year's and hope that we can finish higher up the leader table. We have also hosted two Saturday 6 bell practices and look forward to doing more in the New Year. We very rarely miss a practice evening on a Thursday and plan to ring for Sunday services on the 2nd and 4th Sunday and any other special events. We are as ever grateful to Nick Green and Adrian Roberts for helping us on practice nights. We plan to ring midday on 1st January as we did last year and welcome members of the congregation to stay for sherry and mince pies and also have a ring if they wish. 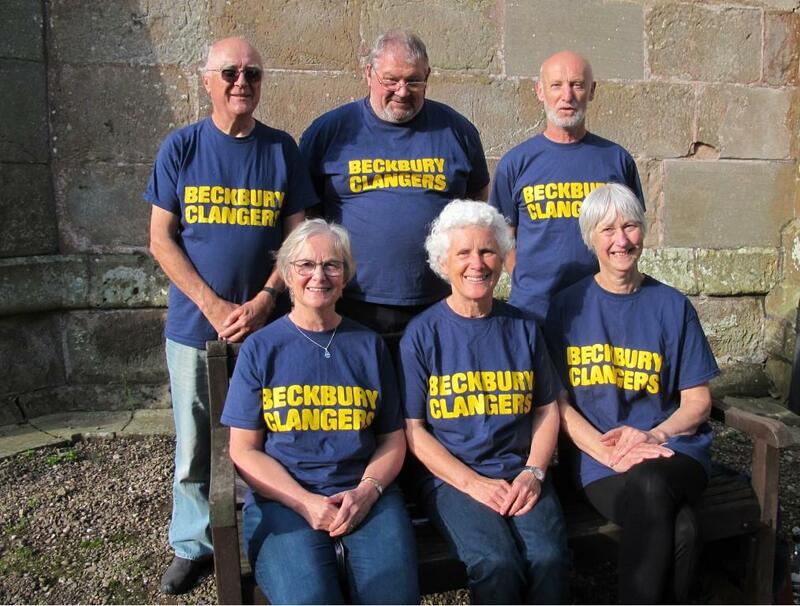 Eleven ringers attended the Association practice held at Chetwynd. The methods rung, included Plain Bob Doubles, Plain Bob Minor, Grandsire Doubles, St Clement’s College Bob Minor, and spliced Cambridge/Primrose/Norfolk/Ipswich Surprise Minor. The raffle run by Peter Woollam raised £17 for the BRF, and the prizes of wine, chocolates and tomato plants were won by Madeline Harris, Edric Broom and Geoff Harding. Thanks go to Rob Herbert and Annette Bailey for hosting the practice; and to Sue Askey for providing the refreshments. The second Association training morning of the year took place at the Edgmond Ringing Centre. 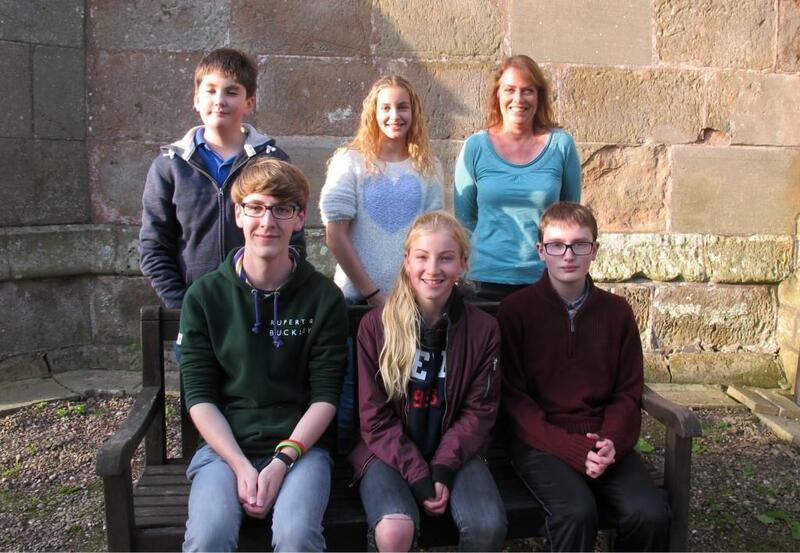 Vicki Sivess (Meole Brace), Claire Unsworth (Stanton), Jenny Hodnett and Sam Lloyd (both Shifnal) were the students. The ringing included call changes on eight, Plain Hunt Doubles, Plain Bob Doubles, Grandsire Doubles, Stedman Doubles, and Cambridge Surprise Minor. Tony Freemont, the Association’s Training Officer, was helped during the morning by Mark Adams, Edric Broom, Rob Davis, Alan Glover, Gill Glover, Chris Fraser, Madeline Harris, Peter Neil, Biff Patterson, and Cordelia Warr. Thanks to Edric Broom for preparing the bells and the simulator. The seventh Association peal of the year was rung at Edgmond to celebrate the birth of Enid Mae Darby on 30th April 2017. 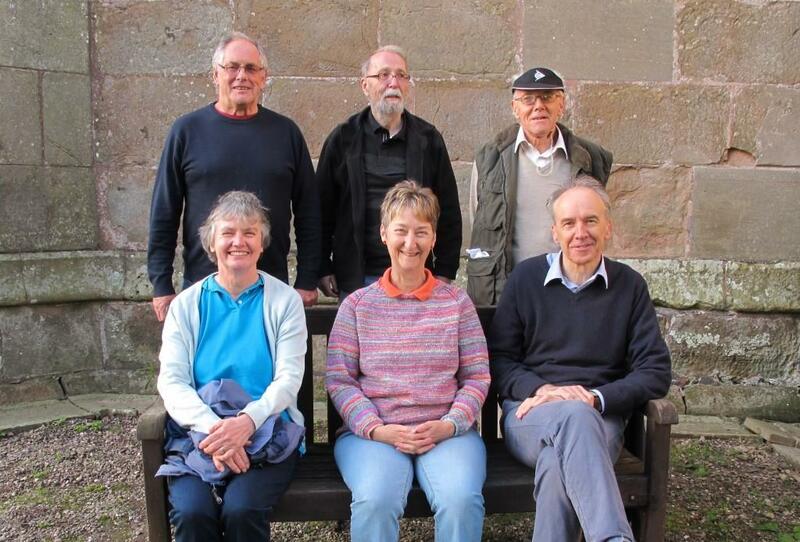 Seventeen ringers travelled to Hodnet for the April 8-bell practice. The ringing included call changes, plain hunt, plain courses of Plain Bob Triples, Grandsire Triples, and Stedman Triples, and several touches of Grandsire Triples, one of which nearly came round. The Ringing Master is grateful to the more experienced ringers who came along to help. The towers represented included Albrighton, Baschurch , Bicton, Calverhall/Ightfield, Edgmond, Hodnet, Market Drayton, Meole Brace, Oswestry, Wrockwardine, and Wem. About fifteen ringers made the journey to Stanton for the April 6-bell practice, including several from the local band. Under the direction of Tony Freemont the ringers practised call changes, Plain Bob Doubles, Stedman Doubles, Grandsire Doubles, Cambridge Surprise Minor, Kent Treble Bob Minor. The towers represented at the practice included Meole Brace, Atcham, Oswestry, Edgmond, Market Drayton, Stanton and Wem. Thanks go to Claire Unsworth for hosting this practice and providing chocolate brownies to sustain the ringers. These took place at Norton-in-Hales. Twenty two ringers attended and the ringing included call changes, Grandsire Triples, Stedman Triples, 5-spliced Surprise Major. It was pleasing to see several members of the local band taking part. After some discussion Pauline Davie, Alison Powell (both St Martins) and Louise Dunsford (Broseley) were elected as members of the Association, just in case they hadn’t been members in the past. Dawn Grundy and Elizabeth Hutchieson were ratified as members of the Association, following their election prior to a peal at Much Wenlock in March. Tony Freemont (Training Officer) reported that there had been a Training Morning at Edgmond in February. Tony reported that the next 6-bell will be at Stanton on 22nd April and the next 8-bell practice will be on 29th April at Hodnet, both running from 10 am to 12 noon. There are still places available on the Training Morning to be held at Edgmond on Saturday 13th May, from 9:30am to 12:30pm; contact Tony if you would like to attend. Tony also said that he is hoping to get together all the young ringers in the Association. In Cordelia Warr’s absence, the Ringing Master spoke about the outing to towers in North Wales, to be held on Saturday 10th June. A poster advertising this event will be circulated to all towers once the details have been finalised. Madeline also mentioned the Ceilidh to be held on 18th November at Shawbury Village Hall. Biff Patterson (Report Editor) informed the meeting that the Report /Handbooks were available. Biff also reported that the Lichfield Diocesan Mobile Belfry had been purchased by the Trustees from Alan Hughes at Whitechapel. The Trustees now had to carry out some fundraising and would be allowing peals to be rung on the Mobile Belfry. Andrew Gordon spoke about proposed plans at Wellington to install a 10-bell frame lower in the tower, add two trebles, sound control and to set up a training centre there. In the absence of Brian Kear, Tony Freemont carried out the draw for the 100+ Club. The winners of the first draw of the year are: Cordelia Warr (£50), Kathryn Greaves (£25), Brian Kear (£15), Peter Leigh (£15), Julie Allport (£12) and Nick Green (£10). Thanks go to Jim Vallings for organising the use of the bells, and to Rob and Rachel Luckett for providing tea, coffee, sandwiches and cakes. The next Monthly Practice will be held at Chetwynd on 13th May, from 7pm to 9pm. The special methods will be Stedman Doubles and St Clement's College Bob Minor. The next Quarterly Meeting will be held at Montford on Saturday 8th July. The fifth and sixth peals of the year for the Association were rung at Clungunford and Lydbury North. Congratulations to Annette Bailey who rang her first quarter peal at Edgmond on Wednesday 29th March, and John Pepiatt who rang his first quarter peal at Meole Brace on Saturday 1st April. This was held at High Ercall with ten ringers attending. The ringing included Norwich Surprise Minor (rung while waiting for a couple more ringers to arrive for Major), Cambridge, Lincolnshire, London and 3-spliced. To mark the 90th anniversary of the founding of the Shropshire Association, members were challenged to collectively complete 90 significant firsts during 2016. The final list of these firsts can be seen here. Fourteen ringers attended the Association practice held at Whittington. A wide variety of methods was rung, including Plain Bob Doubles, Plain Bob Minor, Plain & Little Bob Minor, Grandsire Doubles, Grandsire Minor, variable hunt Cambridge Surprise Minor, Beverley Surprise Minor, Norwich Surprise Minor, St Clement’s College Bob Minor, Single Oxford Bob Minor, Double Oxford Bob Minor, and Dixon’s Bob Minor. The raffle run by Peter Woollam raised £19 for the BRF, and the prizes of wine and chocolate were won by Geoff Harding, Andrew Gordon and Jan Snowball. Thanks go to Jan Snowball and Peter Woollam for hosting the practice. The next Association practice will be held at Norton-in-Hales on Saturday 8th April, from 7pm to 8:30pm and will be followed by the Quarterly Meeting. The special methods will be Grandsire Triples and Single Oxford Bob Triples; other methods will be rung, depending on the ringers who attend. All ringers are welcome. 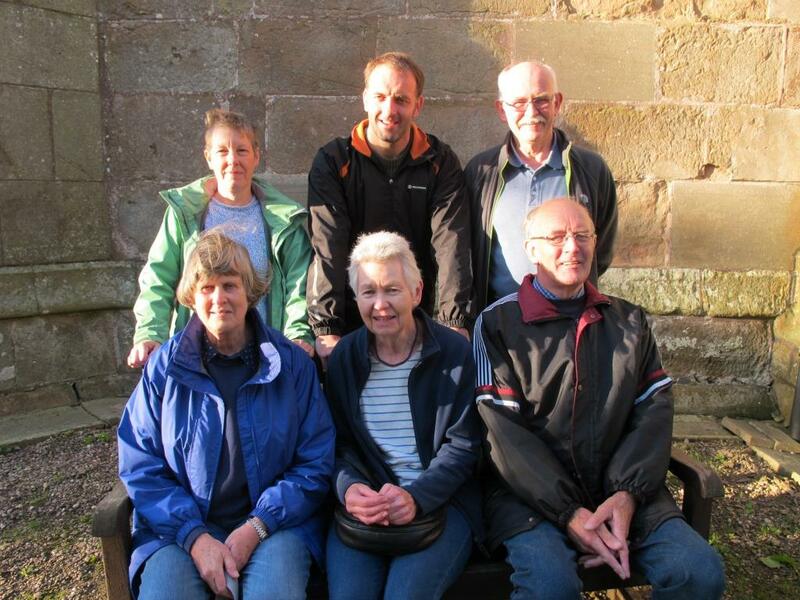 The fourth 23-Spliced Surprise Major peal for the Association has been rung at Much Wenlock. There was a good turnout of ringers at Wem for the March 6-bell practice. Unfortunately, the practice had to be shortened becauseof a funeral in the church, but eighteen ringers, under the direction of Tony Freemont, had a go at call changes on 8, Plain Bob Doubles, Stedman Doubles, and Grandsire Doubles. The towers represented at the practice included Meole Brace, Atcham, Oswestry, Ellesmere, Edgmond, Market Drayton and Wem. Thanks go to Karen Compton for hosting this practice and providing refreshments afterwards. The first variable hunt peal for the Association has been rung at Upton Magna. 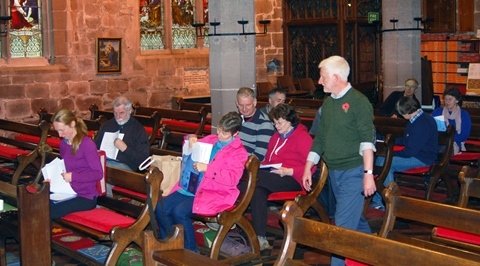 Twenty ringers turned up at Market Drayton for the 8-bell practice. The ringing included several plain course of Plain Bob Triples and Grandsire Triples, a plain course of Single Oxford Bob Triples, and a touch of Stedman Triples that nearly came round. The Ringing Master is grateful to the more experienced ringers who came along to help. 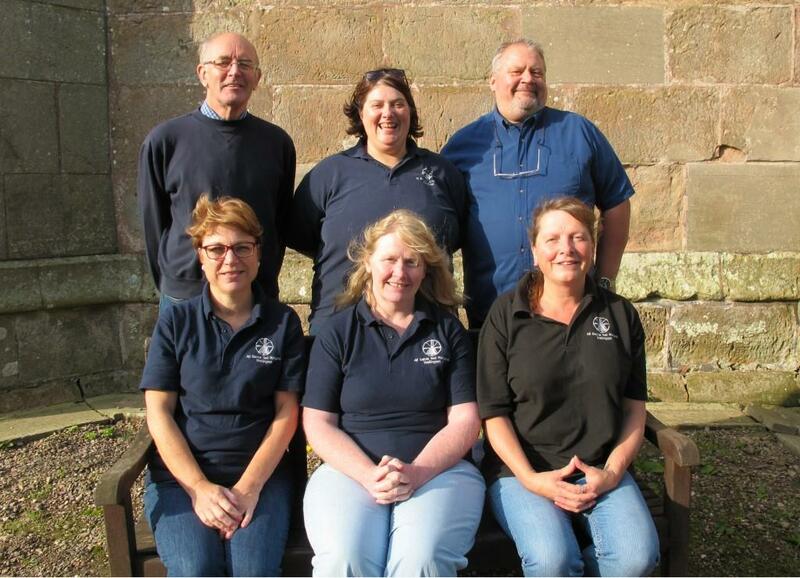 A select band of ringers attended the Association practice held at Bicton. Eight ringers, including three from the local band, had varying degrees of success with Stedman Doubles, Reverse Canterbury Pleasure Place Doubles, Plain Bob Minor, Cambridge Surprise Minor, Little Bob Minor, St Clement's College Bob Minor, and Dixon's Bob Minor. Thanks to Sue & Derek Dancey and Paul Roberts for their hospitality. The first Association training morning of the year took place at the Edgmond Ringing Centre. Fin Shelley (High Ercall), Vicki Sivess (Meole Brace), and Alice Turner (Hodnet) were the students. The ringing included call changes, Plain Bob Doubles, Grandsire Doubles, Stedman Doubles, and Plain Bob Major. Tony Freemont, the Association’s Training Officer was helped during the morning by Mark Adams, Jad Bienek, John Burton, Karen Compton, Rob Davis, Alan Glover, Gill Glover, Nick Green, Madeline Harris, Peter Neil, Biff Patterson, Cordelia Warr and Luke Wilson. Thanks to Edric Broom and Mark Adams for readying the bells and the simulator. Further learning opportunities are available at the next Third Wednesday morning practice at Edgmond on 15th February, from 10am to 12:30pm; the 8-bell practice on 24th February at Market Drayton, from 7:30pm to 9:00pm; and the next 6-bell practice on 4th March at Wem, from 10am to 12noon. The second Association peal of 2017 was rung at Beckbury to celebrate the 100th birthday of David Tildesley. David's son, Richard, built the frame for the augmented peal at Beckbury. These was held at St Andrew's church, Shifnal. Prior to the Service of Thanksgiving there was the opportunity for about thirty members to ring call changes, Plain Hunt Triples, Cambridge Surprise Major, Stedman Triples, Grandsire Triples and three leads of Bristol Surprise Major. The Ringing Master and Mark Adams shared organising duties. Jim Lilley came by train all the way from Shoreham by Sea to ring with us at Shifnal. More ringers turned up in time for the Service, which was led by Rev. Preb. Chris Thorpe. The address was given by the Archdeacon of Salop, the Venerable Paul Thomas; and the organist, Sue Blake, a former ringer at Codsall, kept the hymns going at a good pace. The Archdeacon spoke about the need to make both the Church of England and ringing more accessible to more people and spoke about flexibilty, friendship and forthrightness. This prompted the vicar to call the Archdeacon the effing Archdeacon! The Shifnal ringers' catering team provided a delicious meal of butternut squash soup and a dazzling array of sandwiches and sausage rolls and pork pies. These were followed by a large variety of cakes plus tea and coffee. Archdeacon Paul got the meetings under way. At the Quarterly Meeting, which preceded the AGM, the following were elected as members of the Association: Lisa Basden, Glenville Davies, Alistair Mitchell, Kate Mitchell (all Atcham); Peter Gordon (Beckbury), Christina Perkin (Clive); Tom Gough, Jane Thompson (Codsall); Christopher Parker (Llangollen); Derick Hood, Julia Howard, Josh Oakley (Meole Brace); Katie Buckley, Steve Buckley (Shifnal); Rev Tim Carter (Wellington); Tony Bryant, Mike King, Jacob Sims (Whitchurch). Paul Bennett and Arthur Reeves were ratified as a Non-Resident Life Members following their election prior to a peal. Cordelia Warr mentioned that the social events for 2017 would be an outing in June and a ceilidh in November. 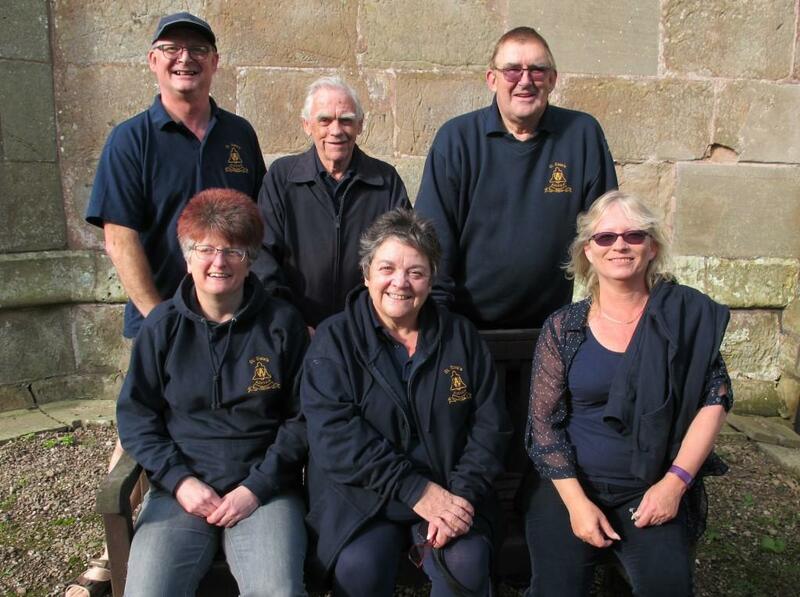 Tony Freemont talked about getting together the youth ringers of the Association with the aim of entering a band in the Lichfield Diocesan Striking Competition. Tony also suggested that the Surprise Major practices might occasionally be replaced with 8-bell practices, in order to provide opportunities for progress for those who would like to move on from 6-bell ringing. There was also mention of the CRAG online survey which had opened that day and would be available for all ringers to take part in until 3rd February. After the usual business of apologies, Minutes of the last AGM, and matter arising from the Minutes, Madeline Harris gave her Ringing Master's report. Madeline touched briefly on a few of the highlights of the year, including: the 90th anniversary of the Association and the need to look forward to the centenary in 2026; the sixteen peals that had been rung including five to mark the 90th birthday of the Queen and two to mark the 90th anniversary of the Association; the five members who rang their first quarter peals during the year: Vicki Sivess, Brânn Himlin, Sue Bower, Rob Herbert and Andy Digby. Madeline also remembered Richard Blagrove and Barry Lewis who had died during the year. Madeline thanked the Committee for their hard work; all those members who had supported the Association by buying raffle tickets or joining the 100+ Club; and all the bands that had hosted meetings and events. The support given to the Association by its President and Vice-President, Bishop Mark Rylands and Archdeacon Paul Thomas, was also appreciated. In the absence of the Treasurer, Madeline Harris presented the accounts of the Association and they were approved by the meeting. The Independent Examiners, Brian Kear and Karen Compton, had inspected and approved the accounts and Brian reported that he and Karen were happy with how the accounts had been presented. Brian asked that when money is given to the Treasurer it should be accompanied by a note of what the money is for. This will make the life of the Treasurer much easier. Geoff Harding (Bell Adviser) reported that he had carried out two inspections in 2016, at Wroxeter and at Childs Ercall. 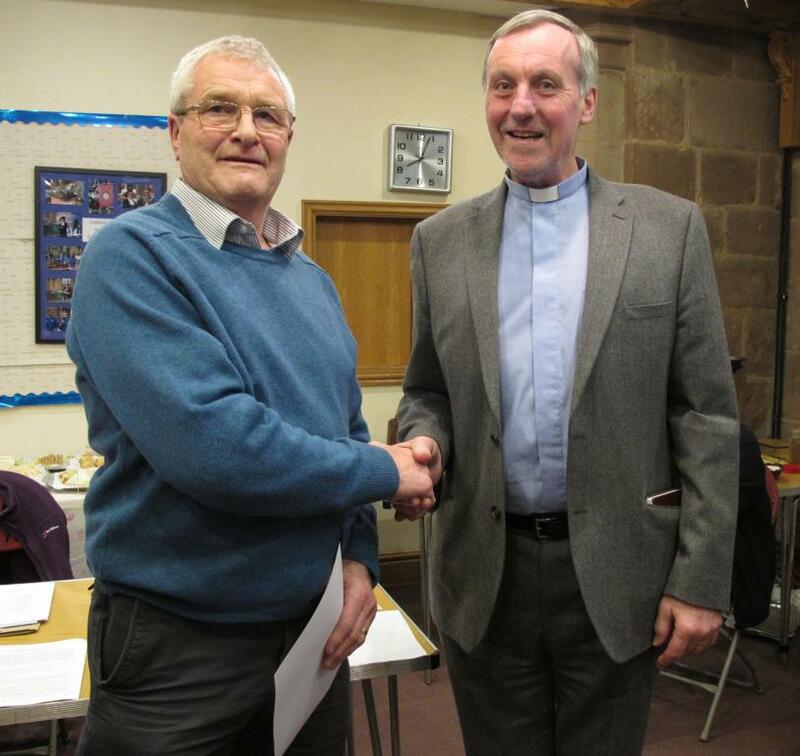 A BRF grant had been made to St Martins, and grants had been approved for work at St Chad's, Shrewsbury and at Wem. Geoff thanked Association members for their support of the Bell Restoration Fund. 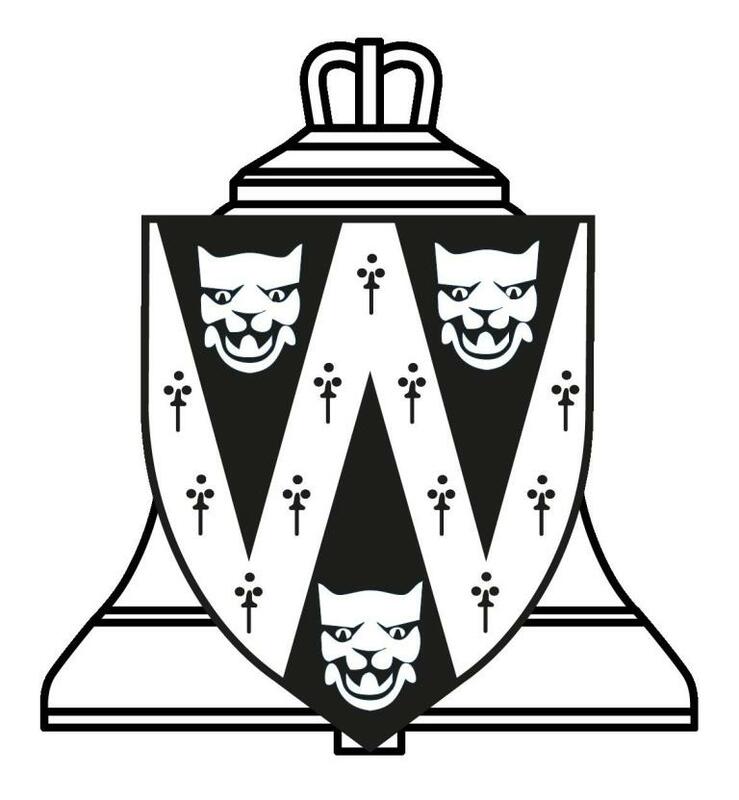 Geoff also reported that the bells at Selattyn, which had been listed as unringable for more than twenty years, would now be available for ringing at special services and at weddings, following much work on the installation. Peter Woollam (Librarian) reported that he had acquired two new titles for the library. Tony Freemont (Training Officer) reported on the success of the Training mornings held during the year. Tony thanked, especially, Edric Broom Mark Adams for their help at Edgmond, and all those who came along and helped with the training sessions. Tony also mentioned the success of the 6-bell practices held in alternate months. Madeline Harris (PRO) reported that four quarterly Newsletters had been produced and sent to towers either electronically or by post. Chris Fraser (Safeguarding Officer) said that she had received no reports requiring investigation. Chris also described the current situation regarding Safeguarding. She mentioned that tower contacts should ensure that visiting bands with young people include someone who is DBS checked. Biff Patterson (LDMB Trustee) reported on the activities of the Mobile Belfry, and mentioned that there had been no Shropshire visits by the Mobile Belfry in 2016. Biff also said that the Mobile Belfry's financial position had improved and that it had been used at a BBC Countryfile Live event held at Blenheim Palace. Peter Woollam (Central Council Rep.) mentioned the Council Review Action Group (CRAG) online survey. Elections for the Committee for 2017 were held. Peter Woollam was elected as Publicty and Public Relations Officer; Jan Snowball was elected as Safeguarding Officer; and Annette Bailey was elected as an ordinary Committee member. All the other Committee positions remained as they had been at the end of 2016. John Crum (Shrewsbury) was presented with a certificate to mark his 50 years of membership of the Association. Certificates were also presented to several members to mark their 25 years membership of the Association. Edric Broom was elected as Honorary Life Members of the Association and Peter Woollam read out the citation for his nomination. In reply Edric spoke about T John Frodsham who had been instrumental in revitalising the Association in the 1980s. Under Any Other Business Mark Adams suggested that an hour's ringing prior to the AGM was not enough; Andrew Gordon suggested that following Whitechapel Foundry's ceasing bell casting it might be necessary to require only two quotes for work rather than three. Madeline thanked the Rev Chris Thorpe for taking the Service, and Archdeacon Paul for chairing the meeting, and Tricia Mitchell, John Burton and all the Shifnal ringers for their hospitality and for providing a delicious tea. Archdeacon Paul said that he would be very happy to be involved in helping to spread the word about bellringing. Peter Woollam sold raffle tickets raising £82 for the Bell Restoration Fund. The glittering array of prizes was won by Cordelia Warr, Mark Adams, Andrew Gordon, Tina Perkin, Edric Broom, Emma Bentley, John Williamson, Jacqui Barden and Chris Fraser. The final draw of the year for the 100+ Club was made by Brian Kear who thanked all those who participated in the 100+ Club and said that about £800 had been raised for the BRF. Brian said that forms for 2017 would be going out to towers in February. The winners were: £50 - Adrian Roberts (Unattached), £25 - David Coleman (Wrockwardine), £15 - Jan Snowball (Oswestry), £15 - Gordon Menhinick (Baschurch), £12 - Mary Ann Oakley (Ruyton XI Towns), £10 - Keith Swinnerton (Hinstock). The next AGM will be held at Meole Brace on Saturday 13th January 2018. The next Quarterly meeting will be held at Norton in Hales on Saturday 8th April. The next monthly practice will be held at Bicton on Saturday 11th February. 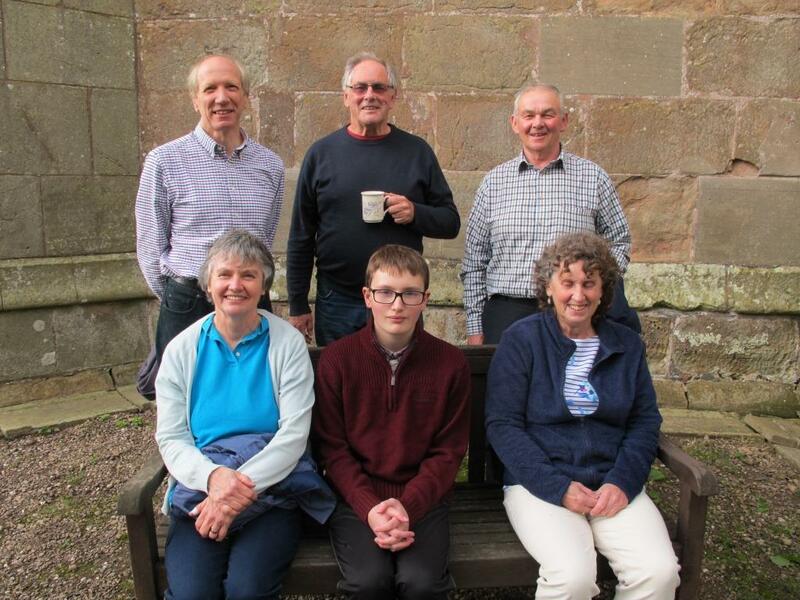 The first Association peal of 2017 was rung at Lapley, Staffordshire, to celebrate the 50th wedding anniversary of Barbara and Bill Deason. This was held at Dawley with 15 ringers attending. Tony Freemont directed the ringing which included call changes, plain hunt on 5, Plain Bob Doubles, Stedman Doubles, Grandsire Doubles, St Simon's, St Clement's Minor and a plain course of Norwich Surprise. The towers represented at the practice included Meole Brace, Atcham, Oswestry, Dawley, Coalbrookdale and Wem. Thanks to the Dawley ringers for hosting this practice and providing refreshments. The next 6-bell practice will be held on Saturday 4th March from 10am to 12 noon, at Wem.